Each grey dot in the diagram below represents a European nation. Which do you think represents Britain's current place in Europe? Click or tap one to see whether you're right, then keep scrolling for the article. 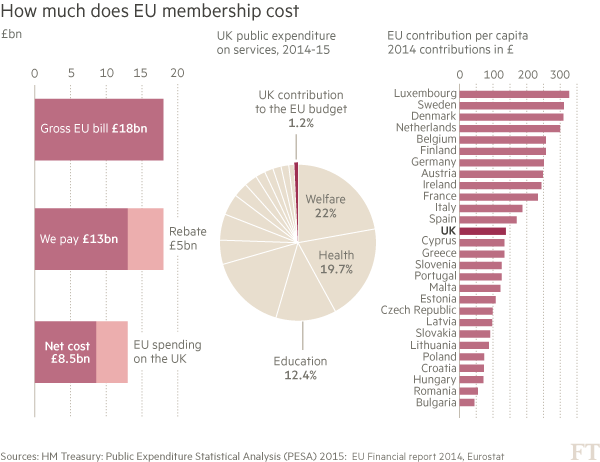 Membership of the EU club costs the UK roughly £130 per person per year. That’s taking into account the rebate won by Margaret Thatcher in the 1980s – a discount equivalent to £5bn in 2015 – and EU funds that the UK gets back – paid to farmers and poorer areas of the country such as Wales and Cornwall. The transfers to the EU are not equivalent to £350m a week. That’s a figure often cited by the Leave campaign ahead of the 23 June referendum on membership. But the number has been discredited by the UK Statistics Authority. So is a bill equivalent to £8.5bn a year worth it? It certainly hasn’t damaged Britain’s economy. 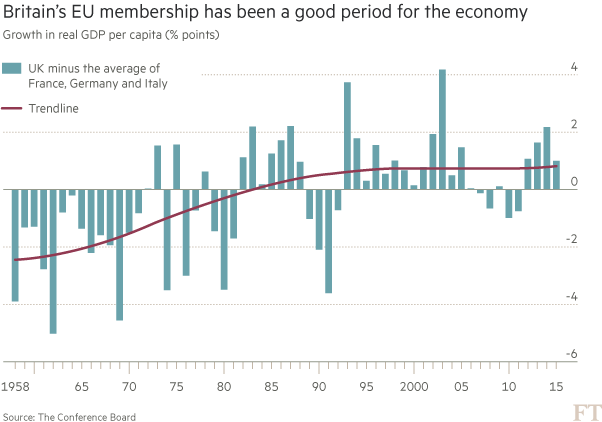 In fact, since the UK joined the European Economic Community in 1973, Britain has done relatively well, outperforming the EU’s largest economies, Germany, France and Italy – and the US. Most economists agree that the country’s economy would be hit in both the short and long term, if the UK leaves the EU and the single market as leading pro-Brexit campaigners propose. Not only could the UK’s access to the EU’s market of hundreds of millions of consumers be impeded, with a knock-on effect on productivity, but lower confidence could undermine investment. 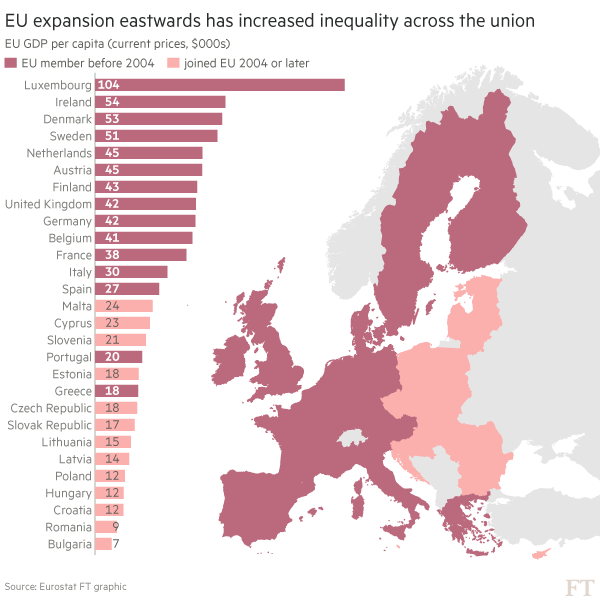 That’s not to say that the EU is a rich countries’ club. The wave of enlargement that began in 2004 has brought in an array of relatively poor central and eastern European countries. This in turn led to an influx of migrants to Western Europe, including the UK, from the likes of Poland, Romania and the Czech Republic. The marked increase in migration – which has far outpaced official forecasts – has stoked rising concern about the new arrivals, strains on public services, and the pace of change in British society. But what would the UK be like without high immigration? Like other historic referendum campaigns before it, the debate on Britain’s membership of the EU has been highly emotional and polarising. The Leave campaign has won momentum in the opinion polls by stressing sovereignty and issuing a call for the British nation to take back control of its fate. The Remain campaign has sought to respond by highlighting many of the economic costs of quitting the EU. But after a debate in which the rival campaigns have used statistic after statistic to attack each other, many people still feel uninformed or, worse still, misinformed. A previous version of the chart above incorrectly reversed the guessed and correct percentage of UK child benefit paid to families in other EU countries.